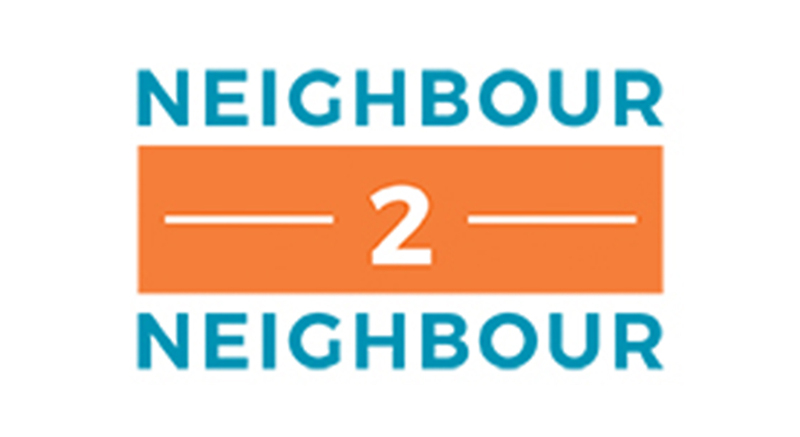 The Ancaster Community Food Drive is door to door blitz of Ancaster homes to collect non-perishable food. 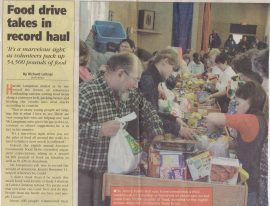 On Saturday February 23rd volunteers will go door-to-door delivering flyers announcing the Food Drive. 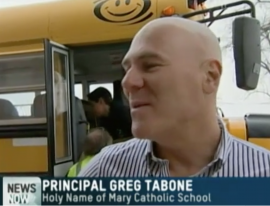 On Thursday February 28, 2019, Food will be picked up at schools and from donors and the facility will be set up. 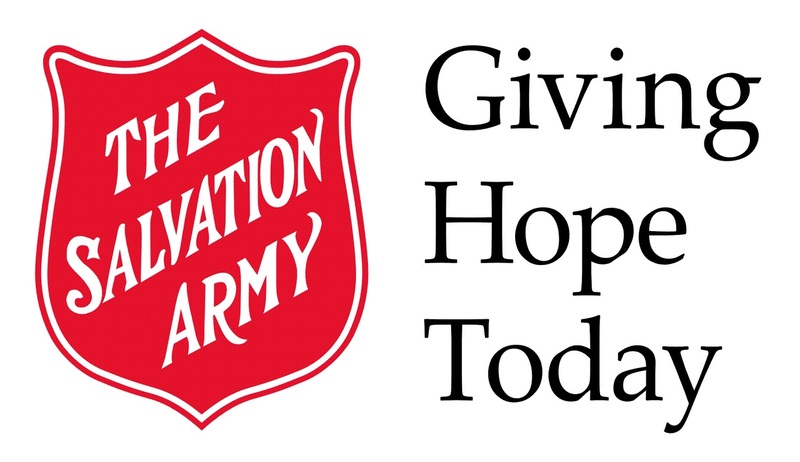 On Saturday March 2nd, 2019 volunteers return door to door to collect donations. The collection will take about 2 – 3 hours with most routes producing an overflowing trunk-load of food. 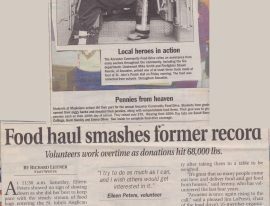 Over 104,000 pounds of food was collected last year a record in our 27 years of running this food drive but volunteers are needed, especially to donate and collect food. We urgently need volunteers to help on the day of the food drive and the day the food goes to the Food Banks. The need is great and together we can make this a successful effort. Please contact us to see how you can help. Most non-perishable food items have either best before or expiry dates stamped or printed on them. All items donated must be checked to ensure that they have not exceeded their expiry and/or best before dates as such items must be removed from distribution and discarded by the agency. Anyone who wishes to donate food are asked to check this critical information on all items and avoid giving any goods which are past these expiry dates. 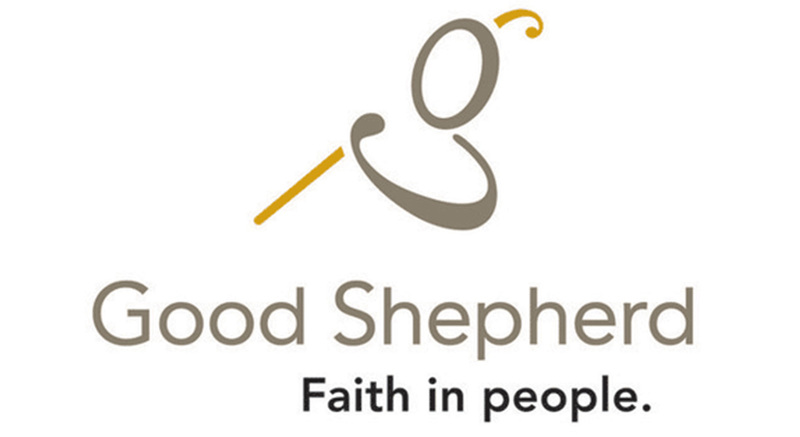 Your assistance in this will save the staff of the Food Bank Agencies time and resources and is greatly appreciated. For those in the community who wish to support the Ancaster Community Food Drive through a financial donation, there are options with direct links to the supported agencies detailed in the next segment of our website. 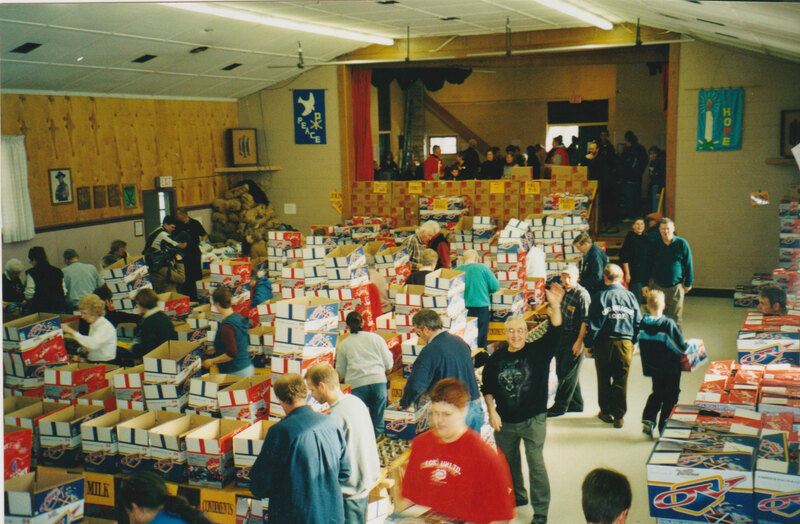 The founding mandate of the organizing committee which began over a quarter century ago has continued to focus on the collection of non-perishable food donations which has achieved remarkable success with a total of 104,000 lbs of food collected last year in March 2018. 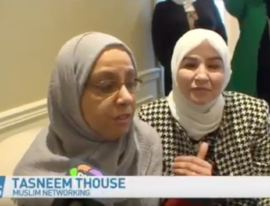 Many residents and community groups have provided financial contributions resulting from fundraising events and personal contributions in support of the Annual Community Food Drive. 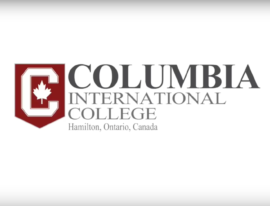 In recognition and in response to inquiries on the financial donations process supporting the collection of food items, the following enhancements have been made on our website to assist our generous donors. 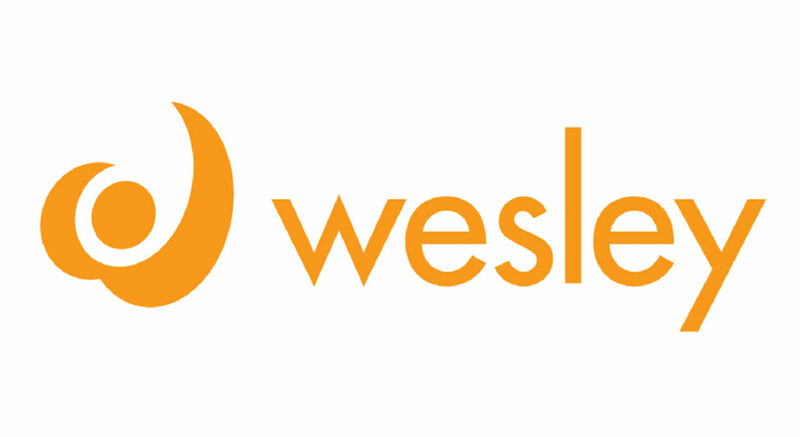 Each of the agencies supported by the Ancaster Community Food Drive can now be accessed directly by clicking on the Agency logo below. You will be directed to the Agency’s financial donation page. 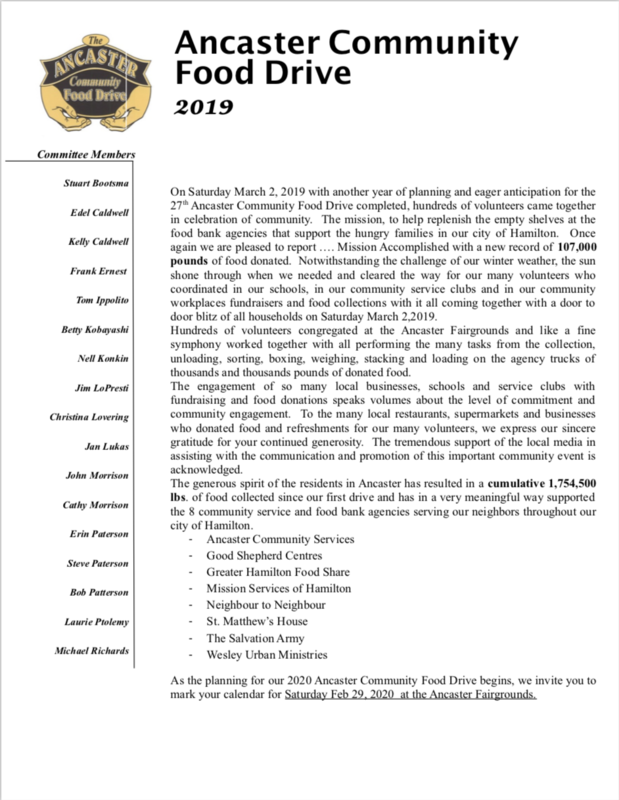 As an example, a number of the residents of Ancaster have directed that their donation for support of the Ancaster Community Food Drive be designated to Ancaster Community Services (ACS) in support of their “Give where you live” campaign. 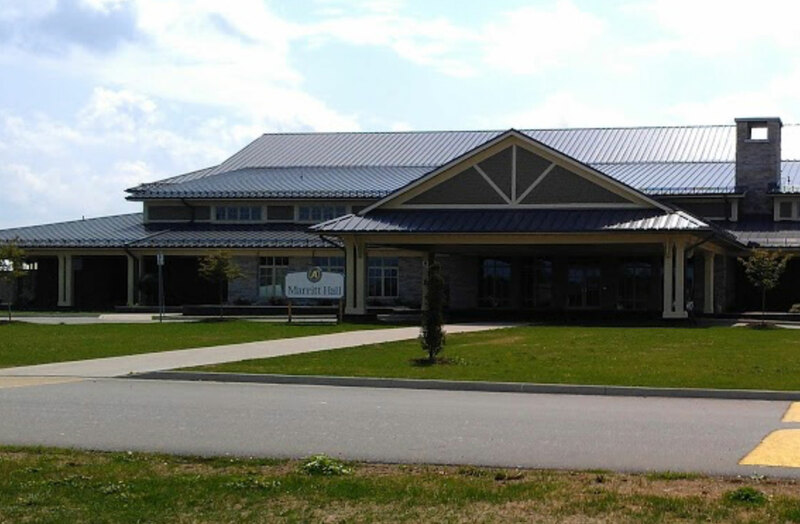 Ancaster Community Services provides many important services and programs to residents in our own community of Ancaster. 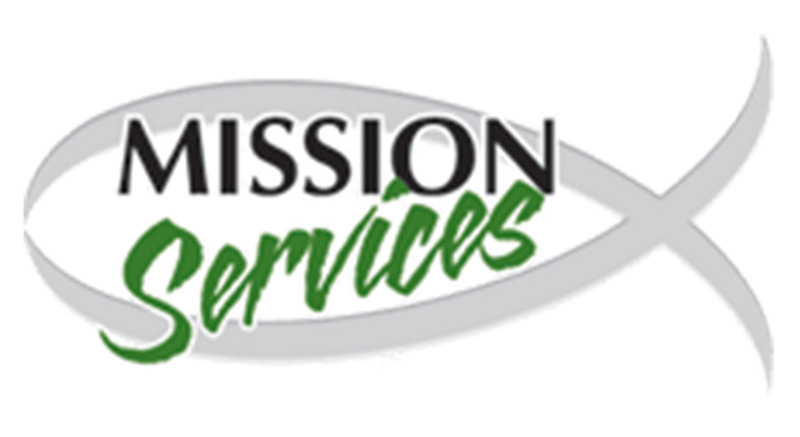 ACS does provide Emergency Food Service to residents with many other important services and programs reliant on the generosity of financial donations from the community. 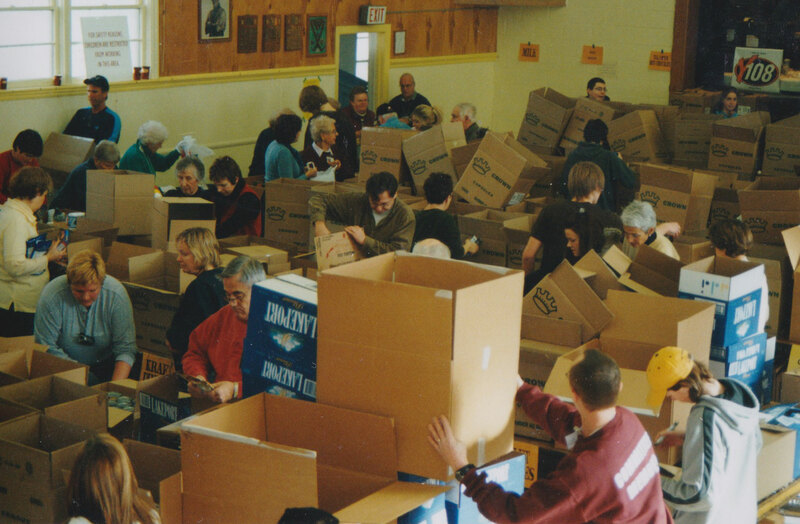 In support of our original mission and purpose to collect food donations to replenish the shelves of our Food Bank agencies, during the winter period we have been able to provide another option that maximizes financial donations through the leveraged bulk purchasing capacity of Hamilton Food Share. Their ability and capacity in dealing directly with producers & wholesalers at source, has enabled Food Share to multiply the purchasing power of a $1.00 donation to a value of up to $5.00. 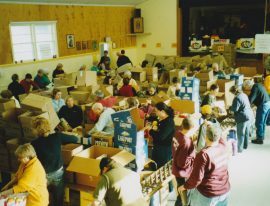 In terms of the pounds of food, it is reported that the same $1.00 donation can result in the purchase of up to 2.5lbs of food. Therefore, for those that wish to make a donation in support of the Ancaster Community Food Drive and direct that the donation be used for the purchase of food items supporting the Agencies in our city of Hamilton, we have made arrangements through Hamilton Food Share. 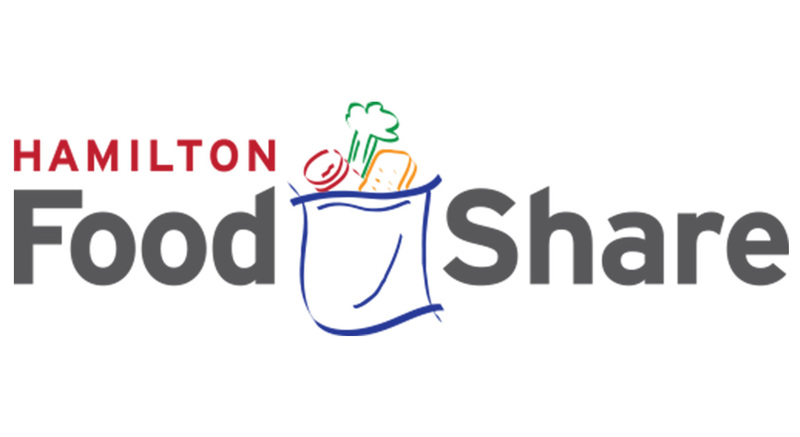 By clicking on the Hamilton Food Share logo below you will be directed to their donation page which will acknowledge and track the accumulated total donations made by donors in support of the Ancaster Community Food Drive. 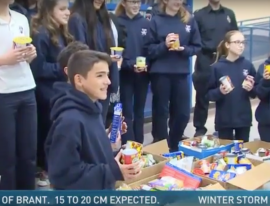 The total amount of donated funds will be applied to a bulk purchase by Food Share and the resulting amount of food included in the total amounts reported for the Ancaster Community Food Drive. The tremendous generosity that all who live, work and play in the community of Ancaster continues to demonstrate in a very meaningful way the power of a whole community coming together in support of those families in our city who are in need of our assistance. 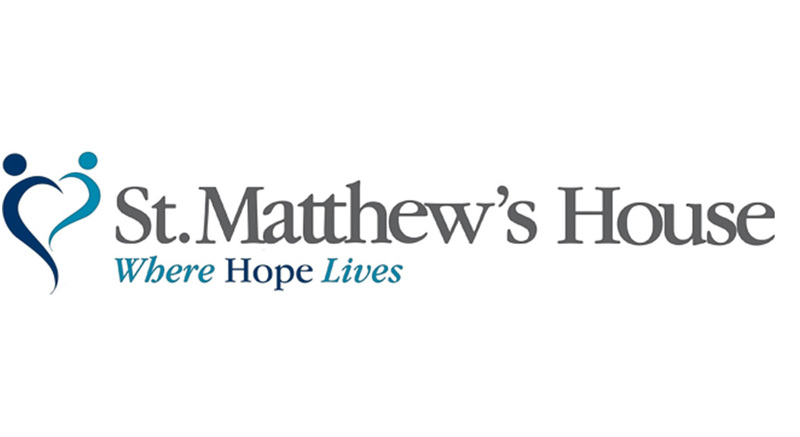 Click on the logos below to be redirected to our supported agencies donation page now. 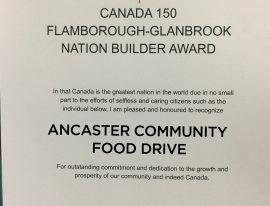 The Accomplishments of the Ancaster Community Food Drive. 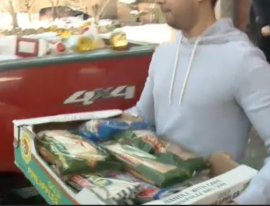 All food donations collected will be delivered to Hamilton’s major food agencies. If you have any questions, please do not hesitate to email us. Follow us on Twitter & Facebook to keep updated.